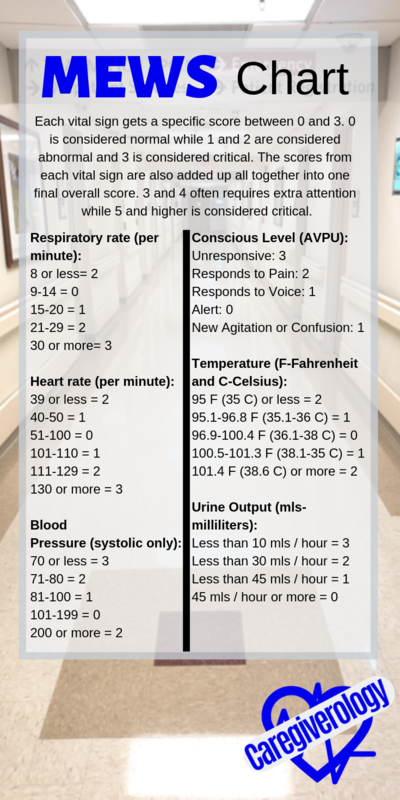 A MEWS score, which is an acronym for modified early warning score, is a calculation done on a patient after checking their vital signs and avpu score to determine if they require more medical attention than they are already receiving. It is currently being used in more and more hospitals to help keep track of changes between each set of vitals. 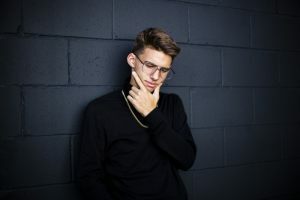 The vitals used to calculate the score consist of blood pressure, body temperature, pulse rate, respiratory rate, and sometimes oxygen saturation. Additionally, the patient's avpu score and sometimes their urine output are also checked. Each vital sign gets a specific score between 0 and 3. 0 is considered normal while 1 and 2 are considered abnormal and 3 is considered critical. The scores from each vital sign are also added up all together into one final overall score. 3 and 4 often requires extra attention while 5 and higher is considered critical. The way the scores are calculated vary from place to place so it is difficult to show just one table that shows what range is given what score but most of them are very similar. When calculating a mews score, you have to take into account that not all patients are the same. Many will have what seems to be a bad score but in reality, they are within their own personal normal range. For instance, many women who are smaller than the average sized woman have a lower blood pressure than what is considered normal. Also, most athletes have a lower resting heart rate than non-athletes. Many patients already know if one or more of their vitals are often abnormal. If something seems off, it doesn't hurt to ask what is normal for them. If they don't know, check to see what their previous set of vitals looked like. If there are no other vitals documented, see if they have a condition or a history that justifies the abnormal reading. Lots of facilities have programs that automatically calculate the score once the vitals are documented. Because of this, caregivers are often required to document immediately after each patient instead of documenting on everybody at once. That way they will get extra medical attention sooner rather than later. When a certain score is reached, additional vitals may be assigned. For example, the facility where I am employed requires an additional set of vitals to be checked every two hours instead of every four if a score of 4 is reached. Ask your supervisor if you are unsure of what your facility requires. Many facilities have their documentation set up to automatically alert a nurse or a rapid response team if a high enough mews score is reached. My facility has it set up to alert the charge nurse if a score of 5 or higher is reached. 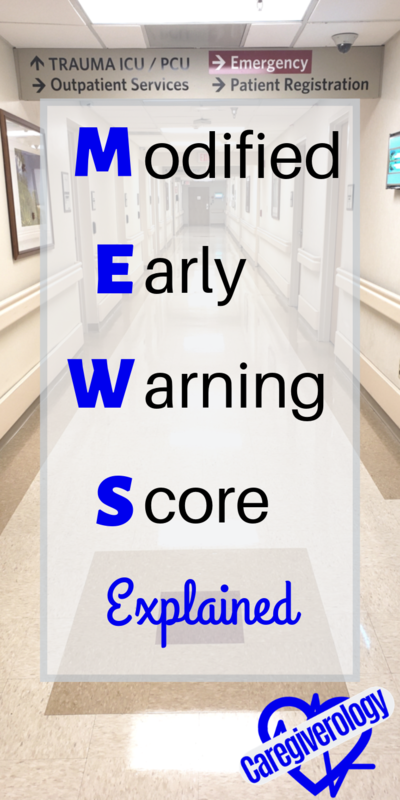 A mews score is just a baseline used to encourage quick action if a patient is abnormal. But this doesn't mean a patient doesn't require additional attention if their score isn't at a certain point. You still have to use your own judgment. For instance, just because a patient's systolic blood pressure is 190 and not 200 doesn't mean they have a good pressure. In fact, for just about everybody, 190 is considered fairly high. Another example would be a pulse rate that changed from 52 a few hours ago, to 99 with no recent activity. A patient can have a perfect score and still need further medical attention. Don't ignore your gut feeling if something doesn't seem right. Take action sooner rather than later.